Tech N9ne’s recently-leaked track “Bad Season” from his upcoming Bad Season Mixtape has made XXL’s “Bangers” section. Krizz’s verse is arguably one of the most ferocious that he’s ever spit. Who came the hardest? It’s really a toss up! 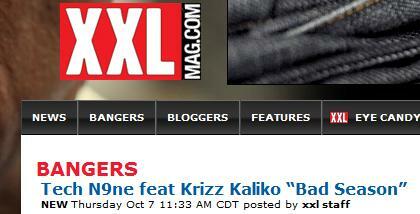 Click here view the page and let XXL know what you think.